Summary: I recommend this walk is done in the summer months or after a spell of dry weather because it would be impossible to cross the River Ure at where this walk prescribes during rainy spells or at any time when the river is in flood or even a higher than average level. 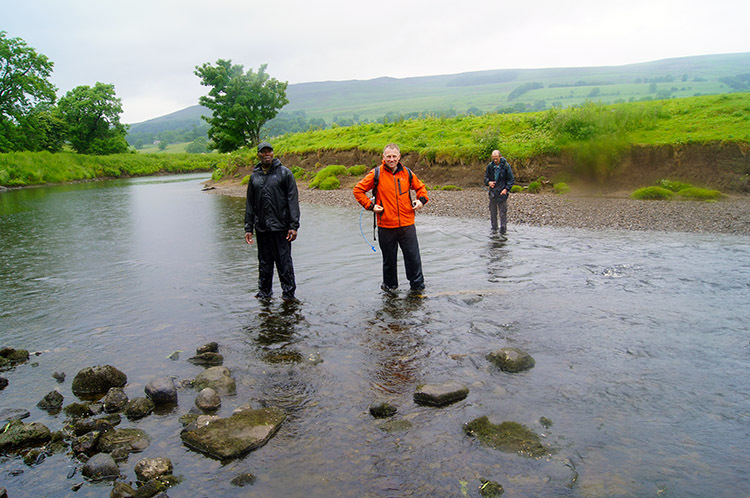 This is due to the river crossings being done over stepping stones or by wading across, as we had to on the return crossing because one set of stepping stones was too wet to stand on without the aid of walking poles. 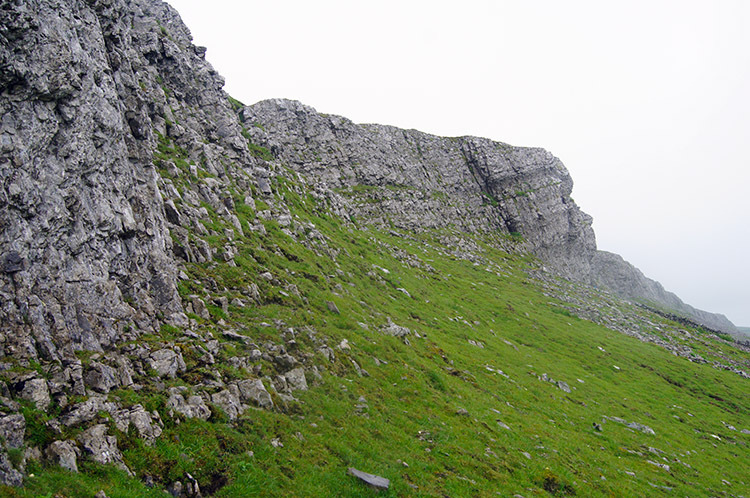 Should the walk be possible it is a gem with two climbs to high level, first to Addleborough and then to Ellerkin Scar. Between the ascents is a descent into a gorge to see a spectacular hidden waterfall. At halfway the pretty village of Askrigg provides a resting point for either outdoor refreshments and or sandwiches or even the opportunity for a pub lunch. Dave and I arrived at the meeting point, the car park in Thornton Rust at 9.58am, with two minutes to spare for our agreed 10.00am deadline. Martyn, Clive and Bernard were already getting ready for the off as we arrived. Martyn cheekily pointed to his watch as I parked the car next to theirs. Hastily I prepared for the off, Dave being already kitted up to go. I had my walking boots and walking socks to put on, then put my gear into the rucksack. My general routine. However, I took my wet weather trousers out of the rucksack, declaring I would not need them. Fair enough, I usually cope without them on decent summer days but why I chose to leave my light walking coat is a mystery. I always take it. Anyway, what is done was done and the five of us set off from Thornton Rust towards Addleborough by tracking south along a stone wall enclosed bridleway which led us onto Thornton Rust Moor. It was dry and the wind was calm although a thick blanket of grey cloud prevented any chance of us seeing the sun. Bernard, being the local, explained to us the characteristics of the moor as we walked across it towards Addleborough with its distinctive table top features. 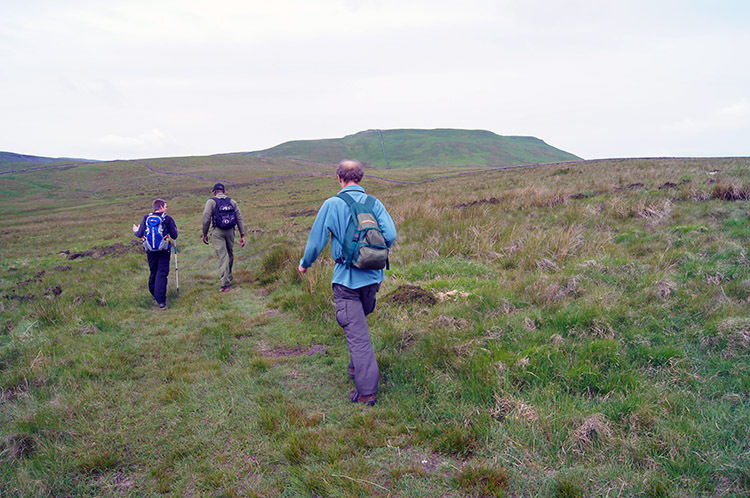 As we gained height on the good track leading us directly towards Addleborough we were provided with excellent views of the uplands directly behind us to the east. Penhill acted as a central focus in the distance with Stake Fell and Thoralby Haw closer. 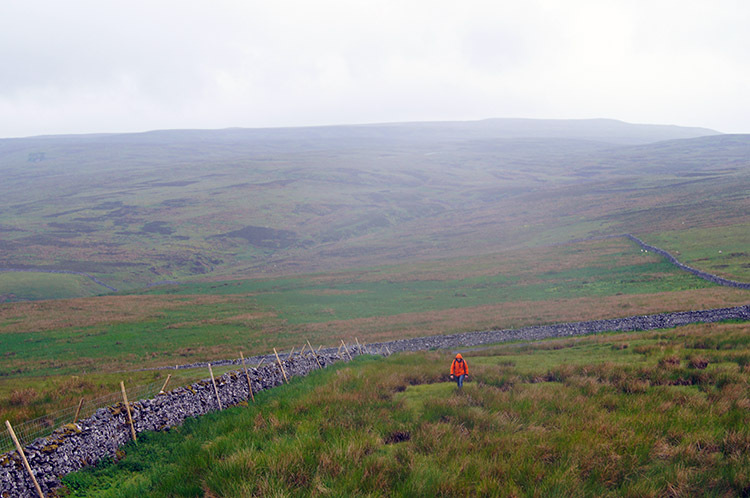 Bernard's family have farmed and managed some of the land on the moors for generations and he pointed out parts which were good for bird nesting and others which were not, useful observations to game managers who maintain the land. He also pointed to where a cairn is on Greenber Edge, site of an old settlement. 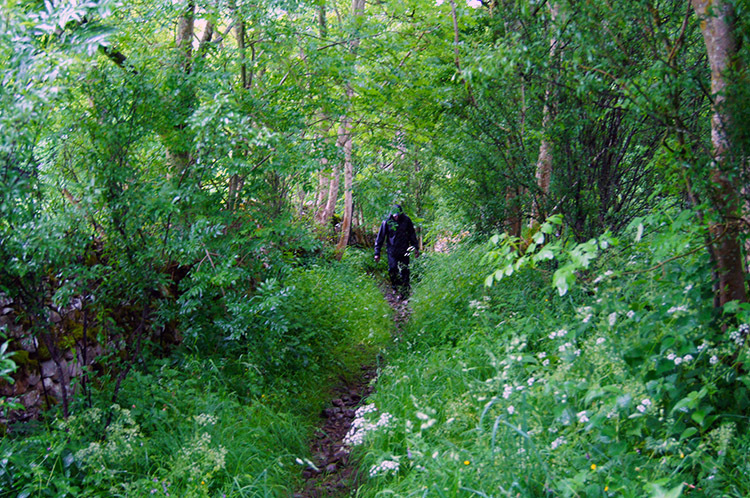 We were heading directly towards another site of an ancient settlement on Addleborough top. After a gentle incline across Thornton Rust Moor the final climb up the bank of Addleborough was a heartbeat raiser. We all ascended to the top and our individual paces and paused. After catching our breaths Bernard explained the history of a few features of the hilltop. 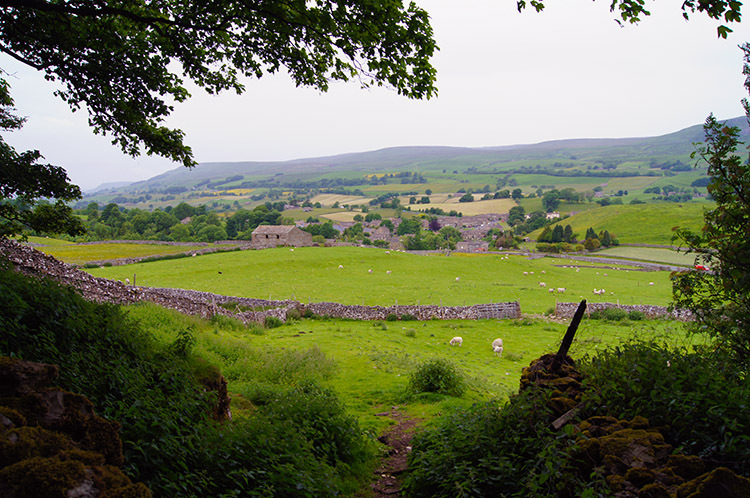 It is thought that the Romans had a lookout station on Addleborough, a logical assumption as it acts as a great lookout point over all of Wensleydale to the northwest and northeast. 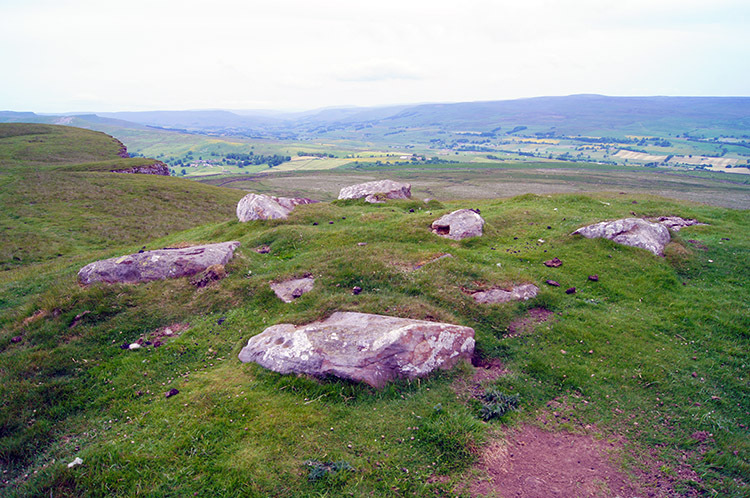 Prior to Roman use it is widely accepted that an ancient British chieftain is thought to be buried in a cairn close by. This is probably at the site on the summit which is marked by a cup and ring circle. The hill, which stands surrounded on most sides by short vertical cliffs is now managed by the National Trust but they placed their first trig point on the site of the cup and ring circle, only to move it to a lower position on the hill where there was no evidence of ancient rite. The groundwork of where the trig originally stood still shows. Oh dear. After spending a little more time on the table top of Addleborough we descended by the west side of the top. 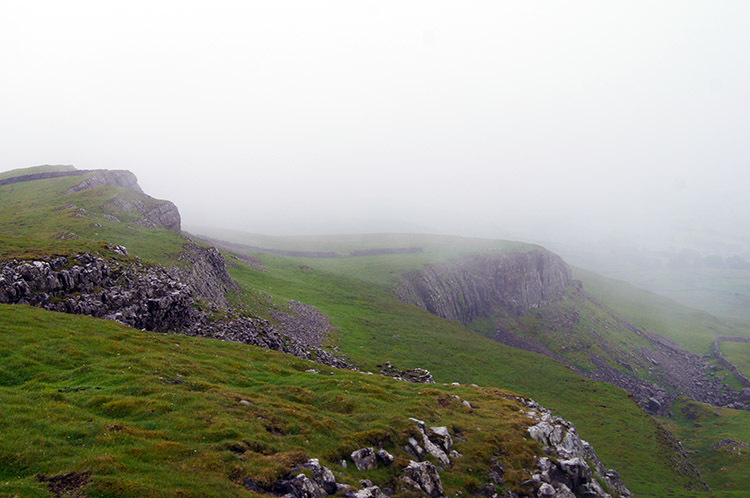 Bernard led us down across upland pasture to a large rock - The Devil's Stone. (Note: This involved finding a safe route from the small cliff top which you may not easily find as it is not obvious. The alternative is to track back off Addleborough the way you came and follow the path around the south side of the hill to meet the road at Carpley Green. Then follow the road down to meet my route at 1.4 km down the road - click here for this alternative route) There is a legend that implies the Devil's Stone was thrown by a giant standing near Semer Water in response to one thrown by a giant from Addleborough. 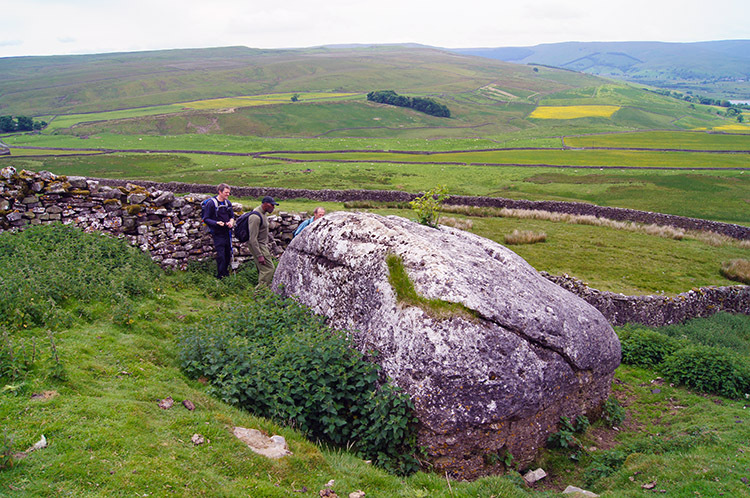 The one thrown by the giant from Addleborough is called the Carlow Stone and it landed close to the edge of Semer Water. The legend does not explain who threw the first stone, nor why the stone throwing began in the first place. Back to our visit to the Devil's Stone; it is marked with a cross on its south side which is closest to a field boundary wall. There is also a sapling of a tree well entrenched on the top of the stone and should it find further purchase into the Devil's stone it may well split it asunder. 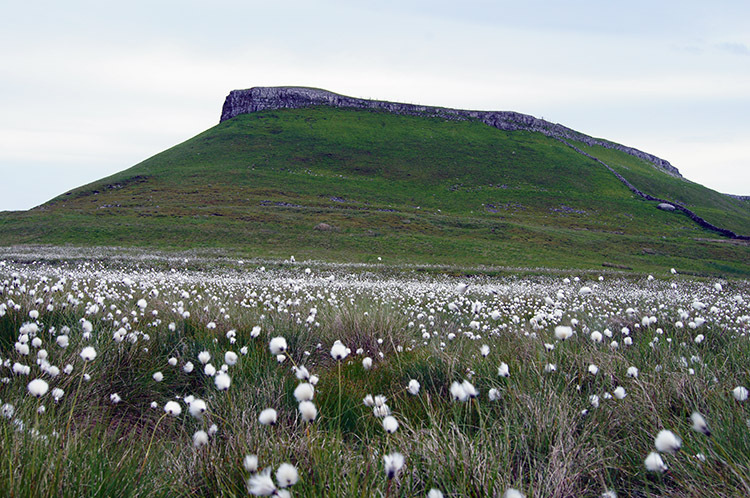 On completing our inspection of the stone we walked northwest towards Carpley Green Road, the section of walking being most pleasant through land carpeted with white Cotton Grass which made a lovely contrast to the green grass. The view west into Upper Wensleydale was best enjoyed on the section of walking between Addleborough and Carpley Green Road as we walked as close to Semer Water as we would get and from our elevated position the views of the lake and its neighbouring hills was set in the nicest of natural frames. 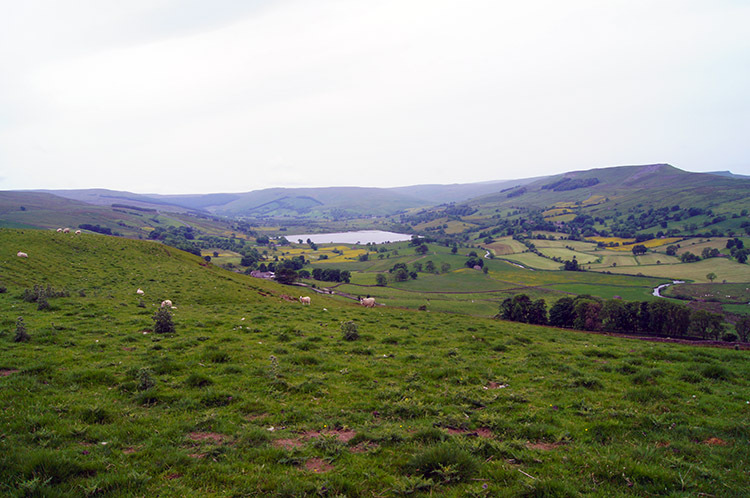 After we reached the road and descended further into Wensleydale the views of Semer Water and its satellites diminished but compensation was provided by closer views of the valley bottom and by some limestone outcrops close to the road. In the one photographed top right we agreed the low cave would provide temporary shelter from heavy rain. Inside we found a couple of old car batteries. I felt drizzle, very light but it was definitely drizzle. "They did not forecast rain until much later" I said and added "about four o'clock BBC Breakfast advised". It was not even noon so I felt a little bit let down by our trusted meteorologists. "Always pack a coat for contingencies" replied one of my walking chums. I could not argue. The drizzle continued to be very light as we followed Carpley Green Road down past a telecommunications mast and to a farm access track to Aldborough House and Scar Top which took us to a path parallel to the top edge of Brough Scar. 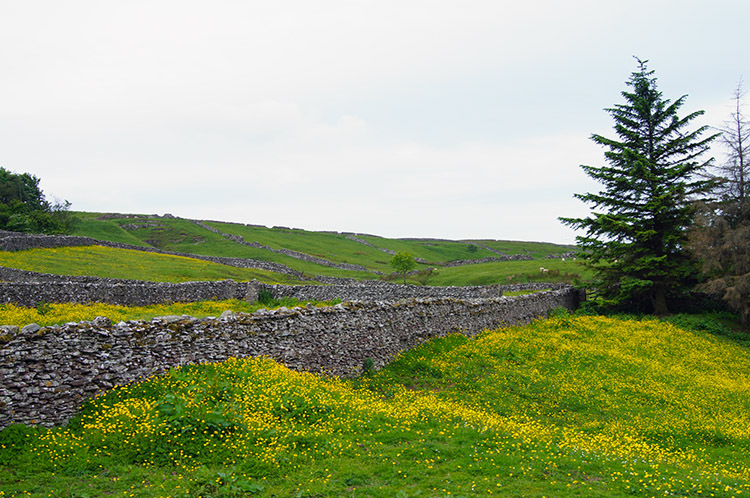 The walk along the top of Brough Scar in an eastwards direction was delightful, a course across three fields full of meadow flowers, dominated by a thick blanket of Buttercups. 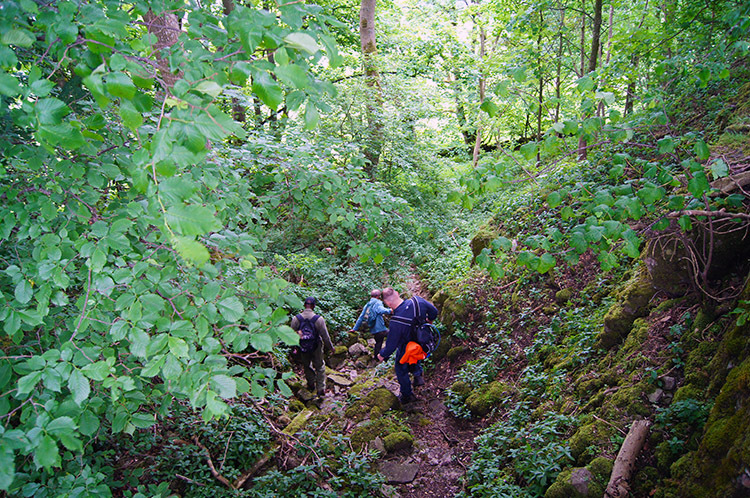 Having also passed the site of a disused quarry above Brough Scar we left the scar top by following a path down through a narrow band of dense woodland. 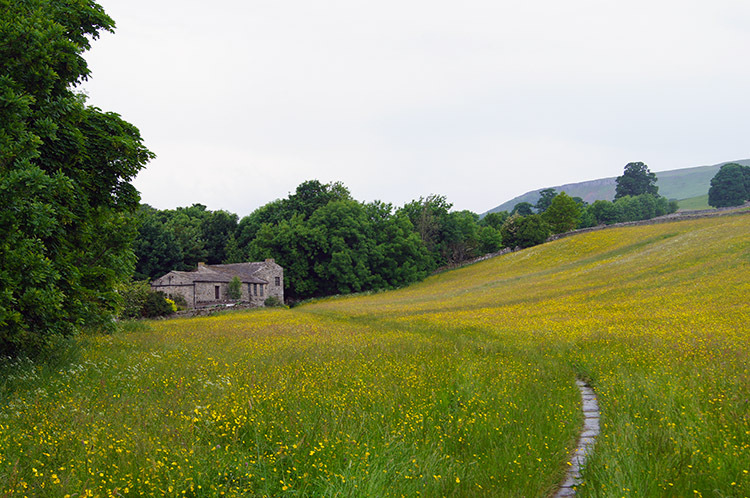 The short downward journey through the wood was followed by further descent across a field to the crossing of the A684 road running through Wensleydale, our point of crossing the road beside Brush House situated between Bainbridge and Worton. At Brush House a gentleman was tending his garden so we each paid him individual greetings which he kindly reciprocated. From Brush House we dissected the field pointing us directly down to the River Ure. Here we knew there was a stepping stone crossing. 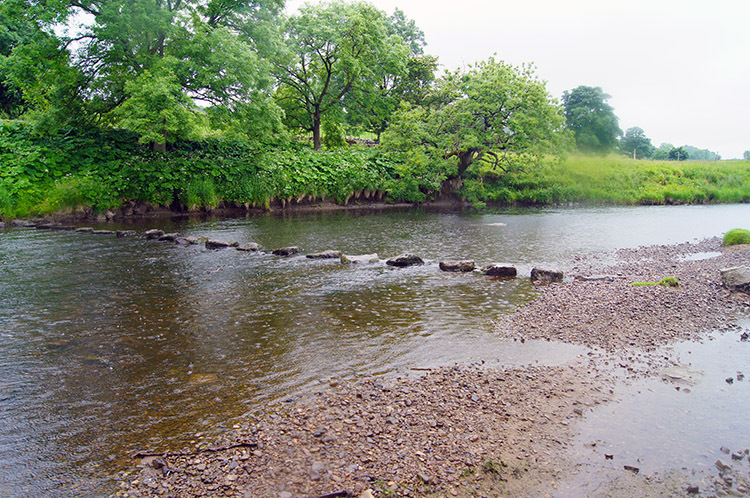 What we did not know was the condition of the stepping stones so we were were extremely heartened to see they were regularly placed across the river and all were sturdy big stones. Each one was well embedded into the river, all gave firm purchase and thus we all crossed with ease. I noted it would take an exceptionally severe flood in the river to dislodge these stepping stones. 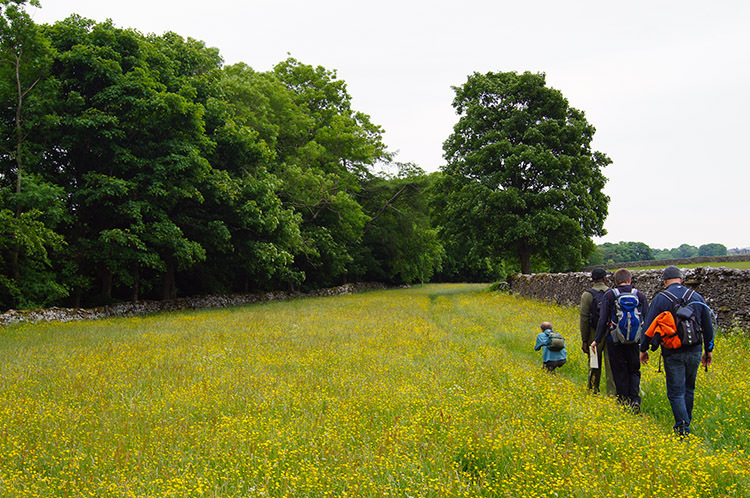 After the river crossing we trundled across a few more fields, the first ones separated by open fences and the next by well maintained stone walls. 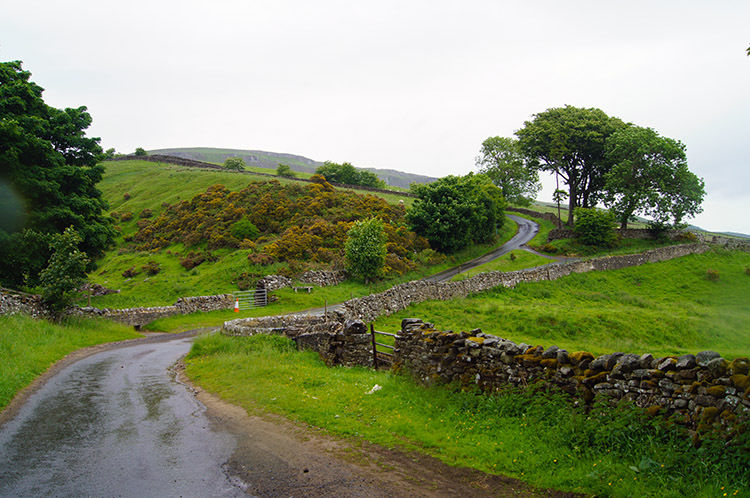 Bernard explained why there was a difference; the first ones nearest the river having open fencing to allow the flood plain to disperse when necessary and the ones slightly higher and closer to the village of Askrigg closed completely by stone to protect the village against potential flooding. His explanation was an obvious one but how many walk by such land management oblivious? 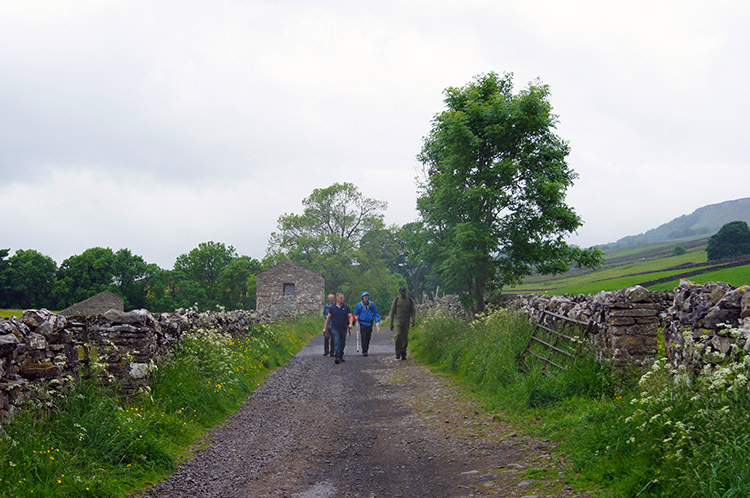 We crossed the line of the old dismantled Wensleydale railway line at Mill Gill Bridge, just south of Askrigg and then walked along a lane into the village. The first impression of the village is its quality of buildings, all in the centre of town are well constructed of local stone. 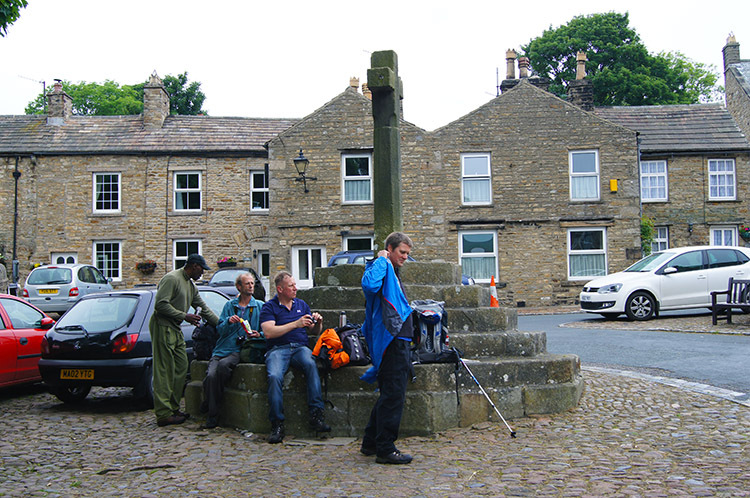 The village church dominates the centre of Askrigg and near the church is the village cross which we all headed to for a refreshment break. While my colleagues rested and took their pre-packed provisions I went across to one of the village shops to buy a drink and a snack to indulge in. When I saw a locally made minced beef and onion pie I could not resist the temptation. I went back outside to join my walking group and thoroughly enjoyed my indulgence. As we ate the light drizzle stepped up a notch and the lads put on their coats. I could not do likewise. 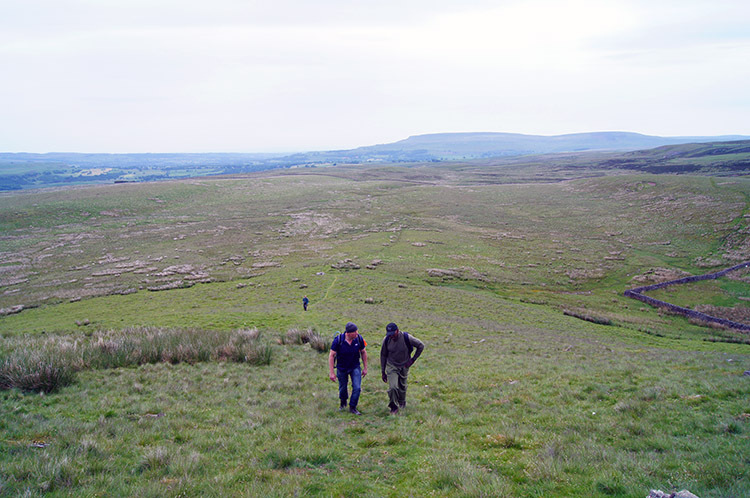 I had originally designed the walk as a circuit of Addleborough and Ellerkin Scar but while these two points were fixed the course between was always flexible. Bernard and I best knew the area, one being a local who lives close by in Aysgarth and the other the designer of the walk and one who had walked the area a few times in the past. With this prior knowledge Bernard and I had discussed the route while on Addleborough and at the elevated height we decided to include Mill Gill Force to the walk. We both knew the waterfall well and as Martyn, Dave and Clive had not been before we thought it would be good to include a visit. Explaining it to them all and the slightly longer distance which would ensue they are gave us the nod. 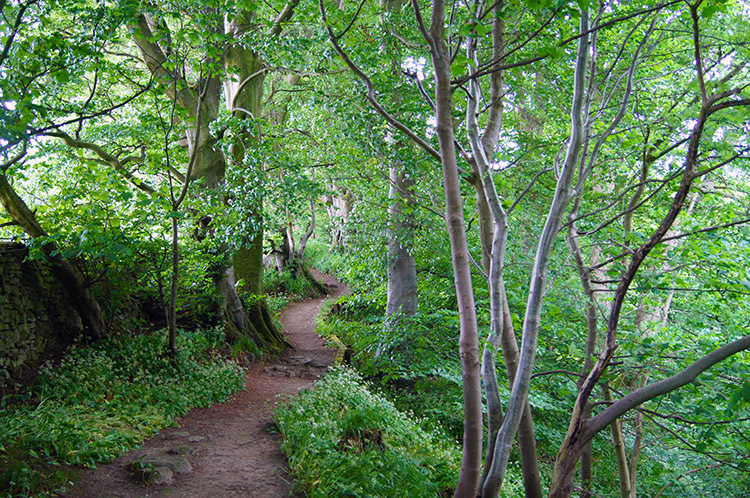 So from Askrigg we set off west through the younger and less attractive part of the village to Mill Dam which led us into a short section of exquisite woodland. This led us along the valley of Mill Gill to the waterfall that is Mill Gill Force, one of those hidden jewels than shelters deep in an enclosed gorge. 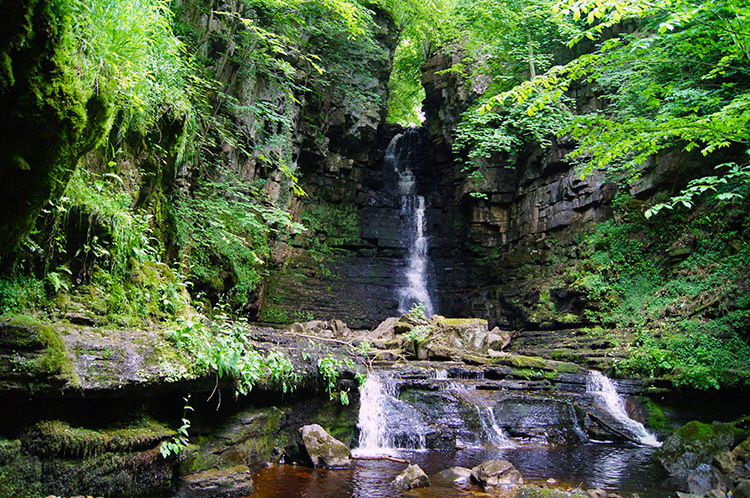 All three newbies were smitten at the sight of the waterfall in its natural amphitheater. We stayed a while, took photographs and then stood and feasted our eyes on it. After the five of us had enjoyed our fill of Mill Gill Force we walked back out of the gorge and along the wood a little further until we came to a footbridge which took us over Mill Gill and up past Leas House towards Low Straights Lane. We dwelt at the bridge for a while to watch Swallows diving low to catch the profusion of flies in the wet and humid air. We did not dwell too long though, the flies the Swallows missed made a feast of us until we got higher and into a breeze that was blowing above their comfort zone. We also passed a group of inquisitive bullocks, one individual bold enough to stand firm as we walked by. Martyn, having had a disagreement with Bovine on a previous walk walked by the stubborn bullock without flinching. Respect shared by man and beast. Then we followed Low Straights Lane for just over a half mile and while we did so a Ewe and two lambs walked ahead of us, finding escape in the last field before we reached the end of the lane. Later the farmer must have wondered why they has strayed so far. After Low Straights Lane we had course to follow the metalled road heading up over the moor separating Wensleydale and Swaledale. The first part of the road journey was to Arn Gill and while on this section of walking the rain got serious. All my four colleagues ducked into the side of the road, found shelter by tree, by barn, or by wall to put on their full wet gear. I carried on in light trousers, tee shirt and wool sweater (thankfully). My rucksack also gave my back welcome shelter. As we continued ascending the road, a steep and fairly tough ascent, there were amusing interludes to the hardship of the climb. First a Curlew feigned injury by landing on the road just in front of us and flapped one wing in a distressed manner as it walked a safe distance ahead of us. Then a Lapwing (Peewit) swooped low across our heads giving a display of chagrin for us being so close to its nesting site. To add to the variety of avian activity an Oyster Catcher next appeared, this time the bird adopted a different strategy for attracting our attention as it hopped along the top of a dry stone wall beside the road. Then above us a crow crossed the sky, then followed by a Black Headed Gull. Five different birds in our sights at one time on a lonely road climb up Long Band to Askrigg Greets. 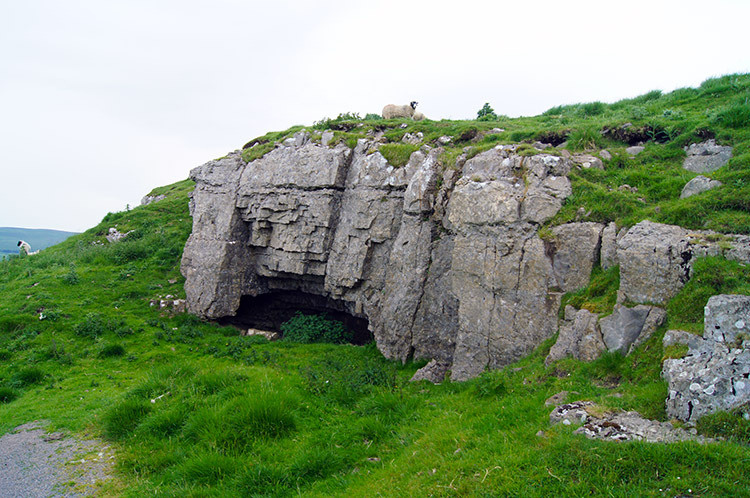 The entertainment, for there was never risk to the birds who all nested in fields bordering the road, took us alongside Ellerkin Scar. 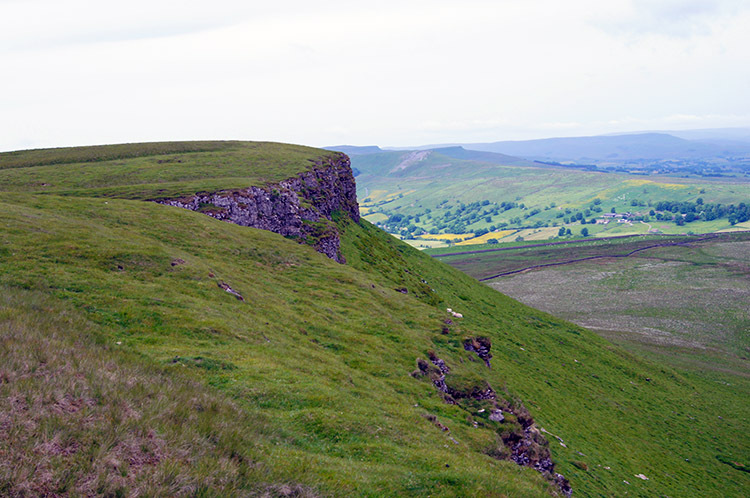 At level height to the top of Ellerkin Scar we left the road and climbed across high pasture and clumps of course grass that swathed Askrigg Greets. The rain was well set in now and I was getting properly wet. The cloud had come low to drop the rain on us without much effort as all. 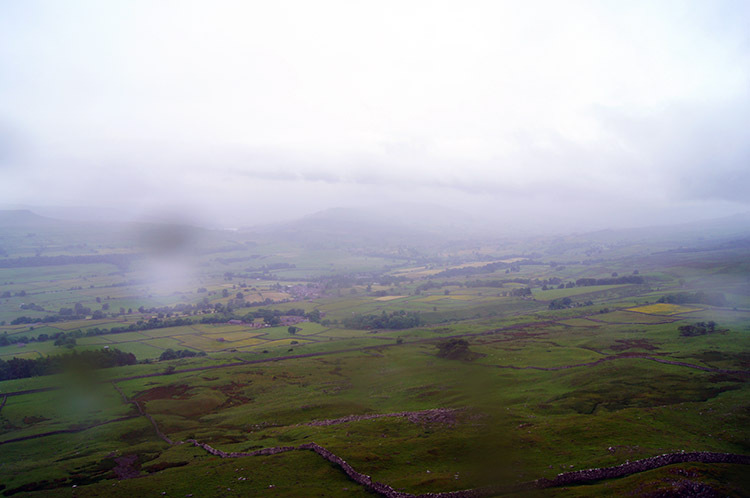 The air was damp, the scene closed in and as we stepped up towards Ellerkin Scar the view of Addleborough directly across the other side of Wensleydale disappeared. It was replaced by white out. It was colder too, definitely chilly. I thought back to leaving Mill Gill and being attacked by the flies in warm humid air - no chance of that up here. My thoughts of discomfort which formed on the hard haul to Ellerkin Scar receded though as I came to the scar, limestone scars and outcrops are always a particular fascination of mine and I looked curiously at the shapes formed by such weathering and exposure as that we were temporarily experiencing but for which the fixed rock have no escape. Bernard and I walked through Ellerkin Scar together with Dave, Clive and Martyn keeping company a couple of hundred yards behind. 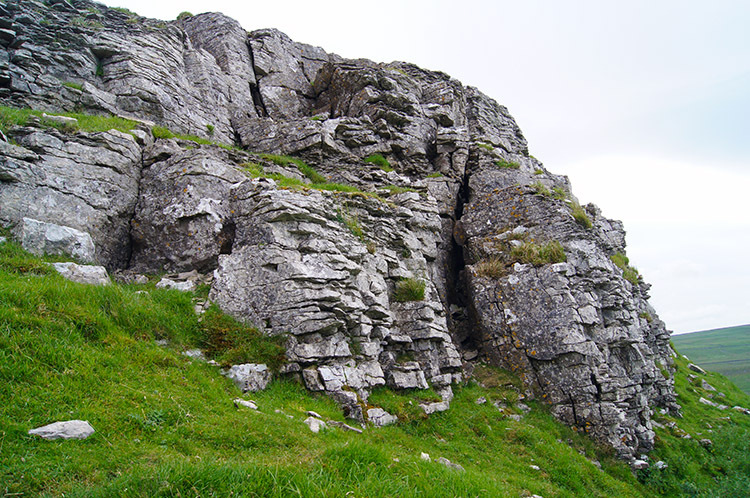 The scar is mentioned in climbing circles with first recorded activity exploration of its exposed cliffs attributed to Mr P Woodyer. On a fair day with time to spare I could imagine making an easy scramble up the rock face myself but today was for gentle walking and not for hands and feet scrambling. And the rain bearing down made me hasten to lower ground anyway so through an appropriate gap we made our way down to below the scar and on down to a hill called Broomber from where we continued down to reach the path leading towards Woodhall. "What are you doing walking in the rain?" Following the path Bernard pointed out the site of old lead mine workings at Beldhaw Hill. There were a series of scars exposed by redundant mining activities and a number of small grass covered spoil heaps. Amongst the disused quarrying site a couple of men with dogs were searching the warrens scattered on the hillside for Rabbits. They both bore sacks which no doubt had their intended quarry in them. As we passed they waved and we waved back. Immediately after passing the site of the old workings we came to another field with an open gate to our left. 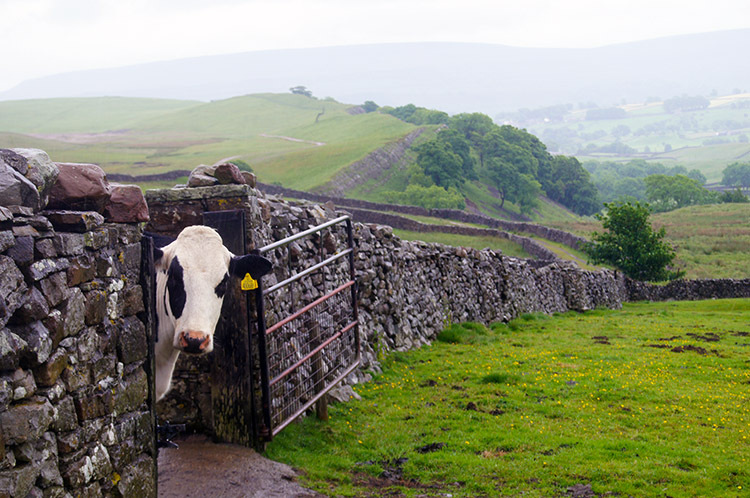 A head poked through the gate, a cow keeping a close and curious look on us while we walked by. The cows head turned to keep us in sight until we passed and then it turned its head from us and once more assumed a position to give Dave, Martyn and Clive the same vigil. A field later and we were off the moor and in the hamlet of Woodhall where we crossed the B road linking Askrigg and Carperby. After crossing the road we followed a lane to West End Farm and then across the flood plain fields to the River Ure and to our second intended crossing of the river by way of stepping stones. On reaching them I immediately noticed they were not as substantial as those crossed earlier. They were above water level though, a good sign. I reached the stepping stones first and tentatively placed my leading foot on the first stone. It slipped on contact, the stone was greasy and on close inspection the others looked no better. Some of the stones were covered in an algae type moss, growth allowed and positively encouraged by the frequent lapping of water over the top surface of the stepping stones. After a little time musing on the quandary facing me I decided it was not safe to cross without aid of poles. Therefore I looked a little way upstream and saw a narrowing of the river with a shingle beach on the south side of the river. I would cross there. Yes I would get my feet wet but it would be much safer and with care I would not fall in. So I went for my fording point and Clive, Dave and Martyn followed. Meanwhile Bernard crossed with the assistance of his single pole. He crossed with care of balance while I simply stepped into the river and waded over. Clive, Martyn and Dave followed. All five of us made it safely across, albeit Bernard with a dry method. 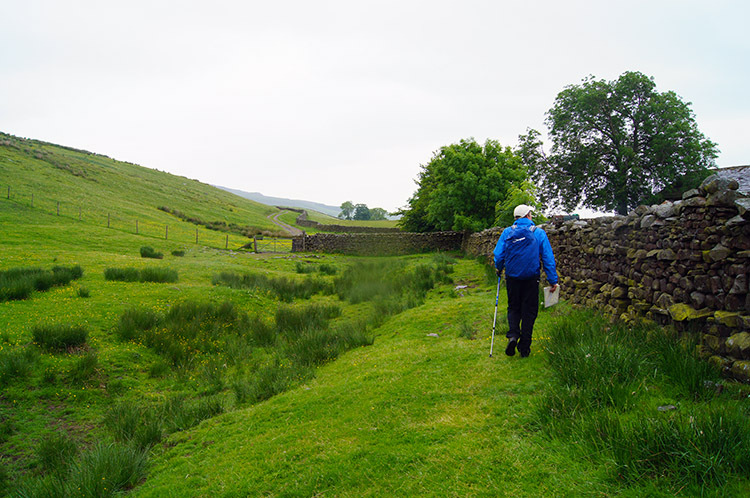 After the fun of the crossing we crossed the A684 to the south side of Wensleydale and finished our walk by ascending to Thornton Rust by overgrown Nipe Lane. After ten minutes walking up the lane and through a few patches of unmaintained undergrowth we reached the village and concluded our walk. Bernard invited us to his cottage in Aysgarth for a hot drink before we made our car journeys home. It was a generous invite we all welcomed. Drinks and Biscuits were enjoyed while we chatted further, friendship forged by a bond for walking in the countryside. I asked for highlights of the walk. 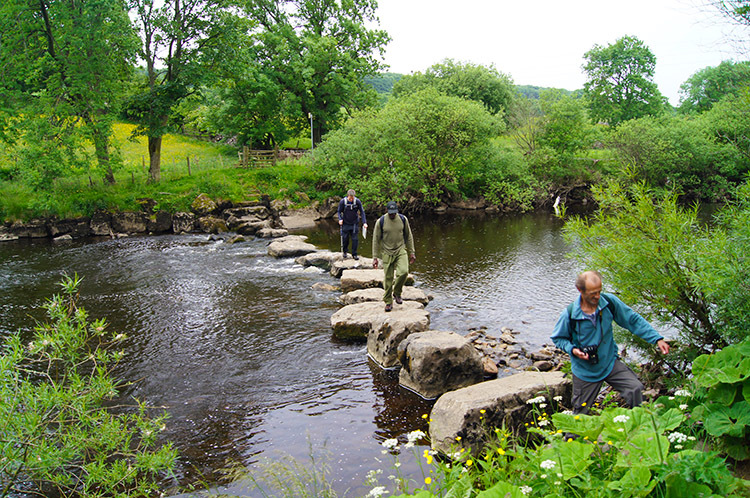 Martyn was sure it was Mill Gill Force for him while Clive enjoyed the wade across the River Ure. I wonder what it was for Dave and Bernard? 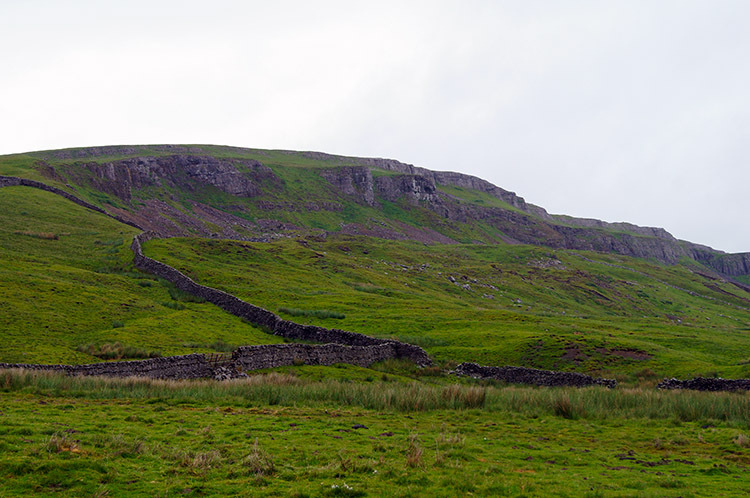 For me it was all good, particularly Addleborough and Ellerkin Scar though drying out afterwards; all down to my daftness in not taking my coat was such a relief. Lesson learned!